Delegates get hands-on with latest digital-transformation technologies, through interactive Experience Zones built around Azure, Internet of Things and Microsoft HoloLens. 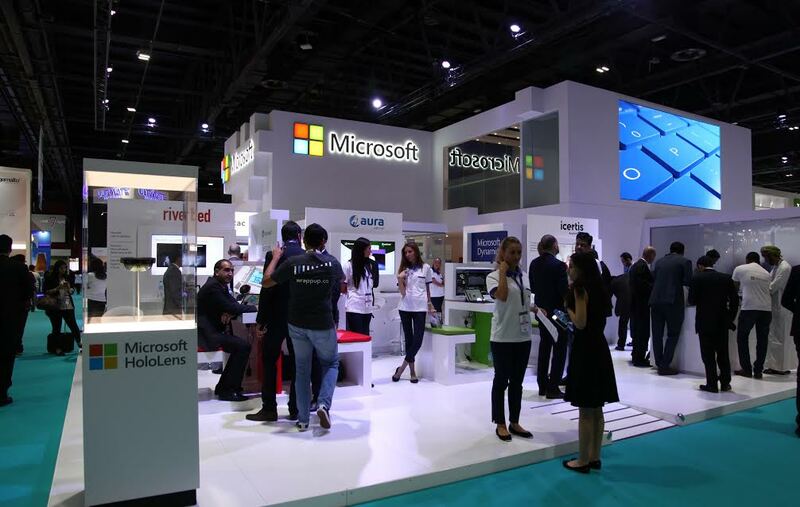 Dubai, United Arab Emirates: Microsoft Gulf unveiled a dazzling array of solutions to the region today, as the 36th GITEX Technology Week got underway at Dubai World Trade Centre. Aimed at helping Middle East organisations – regardless of size or industry – achieve more through digital transformation, the solutions spanned productivity, business intelligence, security, the cloud, mixed reality, artificial intelligence and the Internet of Things. Visitors were able to get hands-on experience of these solutions in interactive Experience Zones, built thematically aroundAzure, Internet of Things and Mixed Reality. Gartner has forecast Middle East IT spending will reach $212.9 billion in 2016, a 3.7% increase on the previous year. In its report, the analyst firm referred to a regional IT industry that “is being driven by digital business” and “a connected world”. Solutions at the Microsoft stand have been built on the company’s Digital Transformation Framework and GITEX delegates from around the world responded positively to the solutions’ potential to allow organisations to engage with customers, empower employees, optimise operations and transform products. The Azure Experience Zone proved to be an eye-catcher at the stand, with some visitors taking the opportunity to meet the Microsoft cloud for the first time. The zone mapped out the milestones on the Azure journey and illustrated how cloud migration can accelerate innovation across teams and skillsets. It also showed how cloud travellers could benefit from integrated business intelligence platforms that deliver real-world operational insights, all while protected by industry-leading security. Other capabilities, including artificial intelligence, Microsoft Cognitive Services and the company’s Bots Framework, were also on display in the Azure Experience Zone. Microsoft hosted an IoT Partner Showcase Area with Ankararef, Dunavnet, Saviant, Iconics. Cybercom and Lego Volvo. Partners exhibited solutions in predictive maintenance, remote monitoring, asset management, real-time intelligence, operational insights, big data analytics and 3D visualisation. Innovations touched upon a number of industries, including government, education, cultural heritage, healthcare, pharmaceuticals, retail, logistics, apparel, manufacturing, electronics, food and smart cities. At Gitex, Microsoft also showcased the world’s first self-contained holographic computer; the Microsoft HoloLens, which was recently adopted by the Dubai Electric and Water Authority (DEWA) for its own digital-transformation programme. The utilitywas able to enhance operations, improve productivity, accelerate innovation and optimise the efficiency of service-delivery to customers. DEWA used HoloLens for scenario visualization, data-gathering and remote maintenance of its Smart Power Plant. The HoloLens solution has helped DEWA staff to promote rapid decision-making; manage and forecast future demand; and reduce power consumption by as much as 30%. Running on Windows 10, Microsoft HoloLens represents a leap forward in computing solutions. The device is a headset capable of generating interactive, high-definition, 3D images and overlaying them on real-world environments. VIP Delegates got the opportunity to interact with holograms in the zone, and contemplate the near-limitless applications of HoloLens for enabling real-time decision-making in a number of fields. Delegates also got the chance to see, first hand, HoloLens’ potential for optimising operations, transforming products and bringing ideas to life. In addition to the HoloLens, Microsoft also presented an assortment of devices at its stand, including the Surface Hub, Surface Pro 4 and a variety of devices from our partners including: the Acer switch Alpha, Asus UX360, Dell inspiron13 7000 with Windows hello, Fujitsu R726, Getac RX10H, HP Spectre 13, Huawei Matebook, Lenovo x1 Yoga and Panasonic Toughbook CF-20; all of which deliver innovative Windows 10 experiences. Windows 10 is running on over 400 million devices worldwide, including desktops, laptops, 2-in-1s, all-in-ones and smartphones. Modern Windows devices offer customers more choice and more opportunity to deliver innovative solutions than ever before. With Windows 10 there is one Kernel, One Store, One device driver model, one universal app platform, one security model, and one deployment and management approach. Microsoft’s regional partners and ISVs were also in attendance at its GITEX stand. Each of them showcased solutions and services built on top of Microsoft’s Azure cloud platform, including IoT, machine learning, disaster recovery and Web apps. Azure has become the platform of choice for thousands of cloud service-providers around the world, in addition to serving as the home for industry-leading tools such as Dynamics, Office, Skype and SQL Server. Platinum partners this year include AuraPortal, Sitecore, Riverbed, NEC Payments, Icertis and Akamai. Gold partners are Emitac Enterprise Solutions, Fotopia, Spusht, Citrix, HortonWorks, Netways, Parallels, Pyramid Analytics, Cloudera, TechMart Solutions, LINK Development, Mindtree, CEM, Alpha Data, ZingHR, II and Veeam.